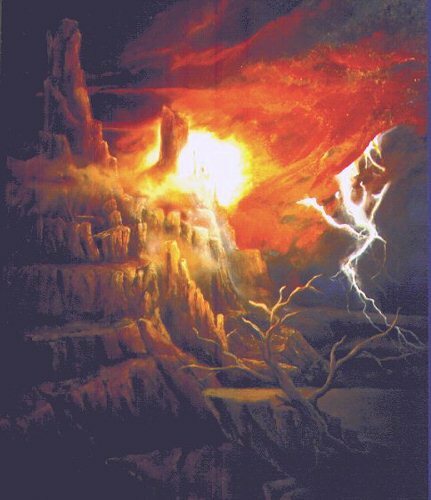 Thunder Mountain, as most of Julian's paintings was and is inspired by New Mexico's amazing sunsets and dramatic skies. There's always a subject in and around the Santa Fe area, where Julian lives and operates JUILL BIOLOGICALS. Sorry you can't see the real thing. All of Julian's paintings are painted using acrylics on large canvasas. As an example, Thunder Mountain's original measures 36"x48" (it's a smaller one). We are sure you realize the quality and image lost in digitizing these. The next time your in Santa Fe, you'll just have to visit. JUILL'S HOME PAGE!!! : "In Partnership With Nature"
MORE OF JULIAN'S GALLERY:: More Free Art!